CarGurus has 4,244 nationwide QX50 listings starting at $10,457. Infiniti is expected to carry over its QX50 compact crossover into 2017, and this leaves most reviewers wondering if this 5-seat, 5-door CUV will ever be comprehensively updated. Sure, it sports impressive agility and plenty of grunt, but an aging profile, somewhat outdated technology features, tepid mileage numbers, and a mere 47.4 cubic feet of total cargo area (with only 18 cubic feet behind the rear seats) means the QX50 lags behind many of its rivals in utility and refinement. In its defense, however, the QX50 did receive a stretched wheelbase for 2016, giving it 4.3 inches of added rear-seat legroom, along with a few tweaks to interior accents, some additions to the list of standard features, and a new options package. Furthermore, the Nissan 370Z-inspired sport-tuned suspension remains standard on the 2017 edition, which means the QX50 should be able to out-handle many of its competitors. In any case, look for the 2017 QX50 to return offered in only a single Base trim packing standard rear-whee drive (RWD), while an optional full-time all-wheel-drive (AWD) configuration gets you the Base AWD sub-trim. It should be noted that the AWD system is good for wintry highways but won’t get you very far off the beaten path. A peppy 3.7-liter V6 powerplant returns, combining with a 7-speed shiftable automatic transmission to put out 325 hp and 267 lb-ft of torque. Fuel efficiency is anticipated to remain an unimpressive 17 mpg city/25 highway/20 combined with RWD and 17/24/20 with AWD. Standard features aboard the upcoming year’s QX50 include 18-inch alloy wheels, keyless entry and ignition, and heated power-folding mirrors, with leather upholstery, heated power-adjustable front seats, and full power accessories in the interior. Further standard interior features include a 7-inch vehicle information display, cruise control, telescoping tilt-wheel steering, a rear-view camera, and dual-zone automatic climate control. Bluetooth hands-free calling is also slated to return standard in the 2017 QX50, along with a single CD/MP3 player boasting 6 speakers, satellite radio, and an auxiliary audio input. The optional Premium package returns for the upcoming year and features aluminum roof rails, advanced automatic climate control, a power-adjustable steering wheel, memory for driver settings, genuine maple cabin inserts, and premium Bose audio with 11 speakers. The available Premium Plus package, which debuted on the 2016 model, adds front and rear parking sensors, GPS navigation, and a surround-view camera system, while the Deluxe Touring package offers 19-inch alloy wheels, an upgraded dashboard setup, and power-folding second-row seats. Standard safety equipment aboard the 2017 QX50 will again include 4-wheel antilock brakes (ABS), traction and stability control, front side-mounted airbags, and front and rear head curtain airbags. Also included are front fog/driving lights and a remote antitheft alarm. Selecting the optional Technology package gets you adaptive cruise control, forward collision warnings, lane-keeping assistance, and a blind-spot monitor, while the available Deluxe Touring package again boasts adaptive high-intensity-discharge (HID) headlights. The National Highway Transportation Safety Administration (NHTSA) gives the current QX50 a second-best 4 stars for rollover safety, while the Insurance Institute for Highway Safety (IIHS) awards the 2016 QX50 its highest score of Good overall. Expect the 2017 QX50 to arrive in dealer showrooms in late summer 2016, again rivaling vehicles like the Acura RDX, BMW X3, and Audi Q5. 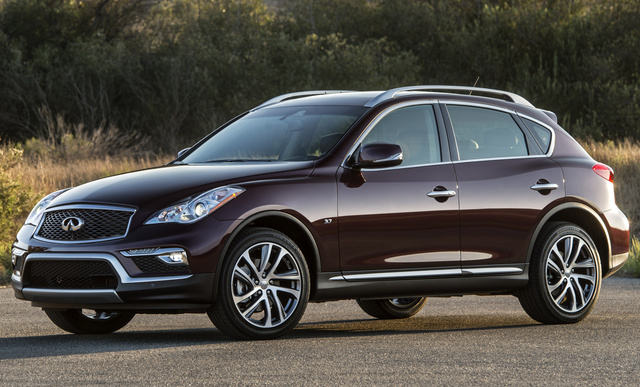 What's your take on the 2017 INFINITI QX50? Houseman9 I bought the 2017 Infiniti qx50 with premium and premium plus packages. I drove the Acura RDX as well. My take is the RDX has more trunk space, better gas mileage, and rides a little softer. Why did I pick the QX50? The handling is so much better, a tauter suspension while still giving a complient ride. I know it gets worse gas mileage, but 325 horsepower is 325 HORSEPOWER with rear wheel drive. A CUV that is comfortable and has nads. The Acura dealership could not get near the price of what I paid for my QX50 with a major redesign coming next year with a turbo-4 and 268 horsepower (yawn) these are going at tremendous discounts. I paid what it would have cost me to get into a Honda CRV touring AWD which is no comparison. I have owned four Hondas in my life and they are great cars. But the deals are out there folks and it pays (saves) to look at this vehicle. Houseman9 oh yeah, 0-60 in 5.5 seconds for those who care. Guru5BCDK Hey Houseman, couldn't agree more. Picking up my qx50 awd this Thursday. Could not get a rav 4 with leather for that price. That's a rav fourbwith 177 hp. I will miss my 08 g35 that IAM trading in though. Houseman9 Back at you Guru. I had a friend that had a G35 sedan and the QX50 has all the attributes of the sedan with a much bigger back seat. That plus you will get a 20hp bonus to boot. These vehicles are remarkedly quiet much more so than the Honda I looked at and the Toyota RAV 4 too. Gas mileage is not the the be-all and end-all when you have to carefully pick and choose your passing situations. I am getting 24.4 mpg per computer, but this is an admittedly rural area. If I remember the headroom was sort of tight in the rear seat of the G35 and the QX50 alleviates that problem. Enjoy the best kept inexpensive secret in the automotive market. I know I am. Have you driven a 2017 INFINITI QX50? When you state that a vehicle is overprices, what are you taking into consideration?